June 25, 1967 – This is one of those few seminal days in world history. We all take it for granted now that watching news or events live from any corner of the planet is not an issue. We can even Skype to anyone, anywhere! But on this date in 1967, the first ever live TV show, called Our World, beamed around the globe. Dozens of countries were invited to feature something from their culture to share. The U.K., of course, asked The Beatles to represent their country. Now this was only three weeks after Sgt. Pepper was released, so they had many new songs to choose from. But that wasn’t The Beatles style. They wanted to perform something BRAND NEW. 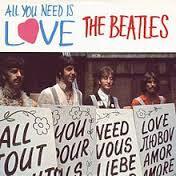 So John either had just written this song or wrote it for the occasion, but it became an anthem for that summer and an anthem for all time – All You Need Is Love. Sitting in the studio were Mick Jagger, Keith Richards, Keith Moon, Graham Nash, Eric Clapton, Mike McCartney, Pattie Harrison, Jane Asher, Marianne Faithfull, and others mostly visible to the camera and with a full orchestra. Even though every one was dressed in bright colors, the show was broadcast in black and white. In The Beatles Anthology DVD Set, the full color version is shown in its entirety. Go watch it today. It was very special, indeed!